When and how did you start armwrestling: When I started high school (2006) met some guys who competed in armwrestling competitions. I loved to have challenge so I went to couple competitions and every time placed in medals with my left arm. When I finnished High school (2010) armwrestling was already part of my life. Big influence for me being in armwrestling were Rūdolfs Cīrulis and Jānis Amoliņš. Started working as armwrestling coach in 2012. 2013 – Vice president of Latvian Armwrestling Federation, 2014 started my club “Legacy”, Coach of Latvian national team since 2014. 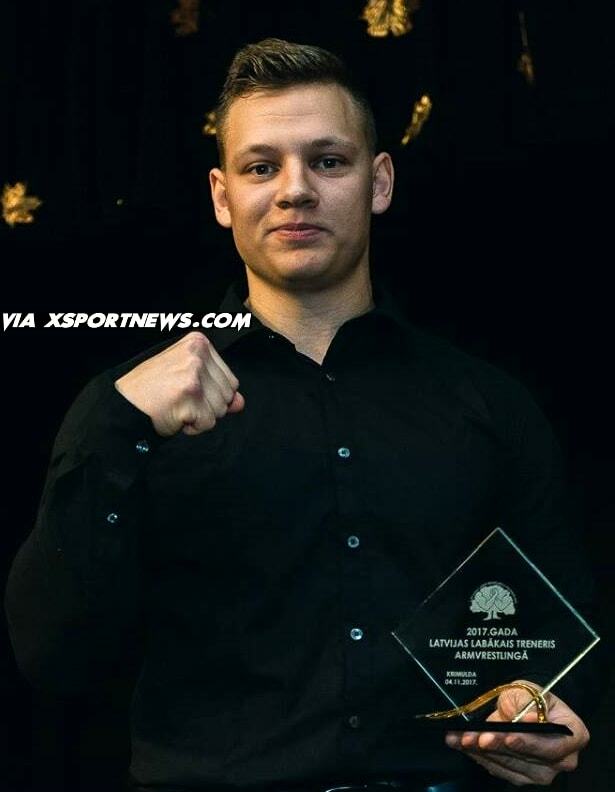 2015 – President of Latvian Armwrestling Federation, Latvian armwrestling trainer of year 2017. Armwrestling goal: Goal has always been to win. But since I started training others my goal has been to help others win. My biggest succes is being able to help others achieve their dreams. Toughest match: Every year at least one. Can’t pick favorite, but you can watch below a video with my latest toughest match vs. DZMITRY MIKHEI. Occupation: Personal trainer for strength sports, Gym owner, President of Latvian Armwrestling Federation. What motivates you: Great feeling that comes from helping others achieve their dream or just help them. Preferred armwrestler(s), someone who you really admire in armwrestling: Jānis Amoliņš – true legend. And I`m not just talking about what he does on table but more about how much hard work is put in his success. Favorite quote / an idea that guides you in life: Luck is the last dying wish of those who want to believe that winning can happen by accident. Sweat on the other hand is for the ones who know it`s a choice. So decide now, because destiny waits for no man. So when the time comes and a thousand different voices are trying to tell you: you are not ready for it, listen instead to that lone voice of descent, one that says you are ready, you are prepared, it’s all up to you know. Where do you see yourself in 10 years from now: Right here. Not going anywhere. Message to your fellow armwrestlers / pullers: If you want to achieve something you have to work for it. If nature hasn`t given you best genetics hard work will make you earn them. Nothing is impossible you just have to find best path for You. INFO: This is 5th armwrestler profile made on XSportNews. Many more profiles of armwrestlers / pullers will follow this one. If you have very good results in armwrestling or you are promoting armwrestling in different projects, you can send your profile to XSportNews – Facebook page.